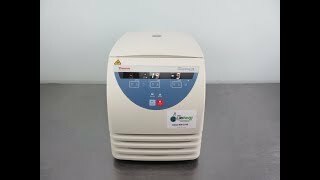 The Thermo Scientific Sorvall Legend Micro 17R Microcentrifuge provides a compact and speedy instrument with temperature control for microliter applications. This microcentrifuge has a speed range of up to 13300 RPM, with an RCF of up to 17000 x g. This refrigerated micro centrifuge has a temperature range of -9° to +40°C , reaching temperature set points in as little as 9 minutes. The Thermo Sorvall Micro 17R Microcentrifuge comes equipped with a maintenance free brushless motor for quiet operation at<56 dBa so you can keep it handy without the distraction. This micro centrifuge can be used with the timer function up to 99 minutes, with the HOLD function, or in continuous duty. This microprocessor controlled centrifuge is easy to set up within minutes through the touch key pad and brightly lit display. This Thermo Scientific Sorvall Legend Micro 17R Microcentrifuge has been fully inspected and validated by our team. All of our lab equipment comes backed with our standard warranty. Should you have any questions, please don't hesitate to contact us.